"This is the first thing to be eaten at every party, and it's sinfully easy! If you are not a big onion fan, don't be afraid. Onion is not the dominant flavor of the dish, and it adds just the right touch. Serve with crackers or cocktail toast." 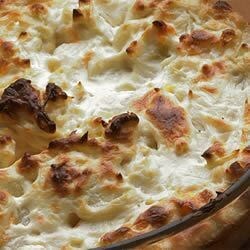 In the prepared dish, mix the cream cheese, onion, Parmesan cheese and mayonnaise. I changed the recipe a little. I used 1 8oz brick cream cheese, 1/2 cup mayo, 1 large onion, and 1 cup parmesan cheese. I served it for Book club and we ate the whole thing! It was delicious! Thanks for a great recipe! I baked it in individual ramekins (I had to broil it a minute at the end to brown it), and it was a great hit! Great with melba toast.